Preface: yes, I know commenting on television is almost so ubiquitous these days that it's pointless, and yes, I know that I have a tendency to veer down the oft-trodden path to nerd-dom, but sometimes something smacks you in the face so much that the only thing left to do is acknowledge its ferocity. I've been away from the blog for a while. There's been quite a bit going on that really doesn't have a bearing on the blogosphere, so I only subjected my designated friends (aka those on Facebook) to it. I was left reeling in some sort of writer's block for a short period of time, not wanting to even think about a sentence, or spelling, or anything even remotely resembling prose; and then, as always happens, I suddenly did have something that I wanted to write about and so, we arrive at this post. The alternate title, since we are, of course, dealing with Fringe was going to be "Much Like Rosie, you have me Riveted, Fringe" but I wanted to go with a title that clearly states, I'm going to be talking about things that are happening on this almost-too-fantastic-to-be-true-show, and if you don't want to know what those things are, you've been warned. For a while now, I've touted Fringe's greatness. I've discussed John Noble and Anna Torv, and my perpetual life favorite, Joshua Jackson (all criminally underrated) and often wanted to shout, "hey Emmy's get your heads out of your rears and watch some actual television instead of soaptastic laugh tracks; and while we're at it you can watch Friday Night Lights too" but it's too late for several reasons. The first being that Friday Night Lights had its finale on DirecTV and by all accounts, I cannot wait to watch it on NBC when it belatedly shows this spring/summer. But that has nothing to do with Fringe. No, what it's too late for, in terms of this show, is that, actually, the Emmy's don't matter. The fans have been there from the beginning, and with the developments in this week's episode, if they're not still tuning in, then, well, they don't deserve to own a television. 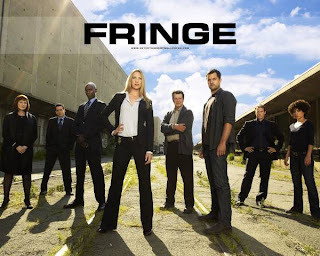 This week's episode started out as weirdly and disturbingly as at least half of the episodes in any given season of Fringe, and it certainly ended that way, in the most blindsiding way possible, for those of us fans who don't ruin the watching experience by hunting down every possible theory on 8,000 message boards, at least. If you guessed the ending, or were one of those people who said "I told you so" before the last 20 minutes, well, good for you. I didn't see it coming and I'm still processing what I'm feeling, which sounds ridiculous when talking about a television show, but I'm telling you, that's what this show does!! Last week's cryptic, "it all depends on which Olivia he chooses" was terrible enough. That dank bowling alley and that prophecy uttered by that kind-of-always-creepy-guy-from-The-Departed-and-Superbad (Sam played by Kevin Corrigan for those of you who dropped out after two dashes) nearly made me scream at the television. Instead I just screamed at my roommates (just kidding, mostly). But this week, well sirs and madams behind Fringe, you've outdone yourselves. For those of you who haven't watched, which, if you're still reading this either means you really enjoy my writing (which I very much appreciate) or like me, you like to spoil a lot of things for yourselves (in which case I say PLEASE don't spoil this show for yourselves!!) I can't really explain the chasm of possible plot options this opens up. Does Peter go back "over there" to his real home to be Papa Peter? Does Fauxlivia even get a choice in whether she keeps the baby? What if something happens and she doesn't carry the baby to term? What happens to Olivia when she finds out Fauxlivia has well and truly stolen the man she loves? What if, by some crazy circumstance Olivia ends up pregnant? Is it possible that the machine that Peter's destined to helm "creates" a new universe in the sense that it MERGES these two universes?! Did that last question blow your mind because I just thought it, and it kind of blew my mind, but it makes total sense, and here's why. The show is on the brink of cancellation, let's face that fact first. With a move to its current Friday slot, the only thing to hope for is a significant bump in ratings for the next couple of weeks. The writers know this. I don't think they'd go into such a shaky 3rd season without leaving themselves the possibility of a double-exit strategy. They either end the series on a satisfying note, or it gets left open for a 4th season (dear television gods, please let it be the second option). A merge of the universes, would essentially put all things to right. Olivia would be both Fauxlivia and Olivia, ostensibly having both Peter and his child. Walter would have all of the missing parts of his brain, Broyles and Charlie and Lincoln would all be together. I mean just bringing the truly awesome presence of Lincoln Lee (Seth Gabel) into "our world" would be reason enough to have a 4th season. I'd guess that everything that there's only 1 of in either universe would make the transfer, so Olivia would also have her mother, her sister, her niece, all of them together, again either opening up the possibility for some great storylines for a 4th season, or giving the fans a truly satisfying end. Astrid would be made doubly smart AND socially acclimated. While we're Fringe Talking, not the same as Jive talking, did I miss something or is there no Nina Sharp "over there" and if so, why? The more I think about this, the more I like the merging idea. But back to a previous point, the reason I loathe Fauxlivia: She seems to be the reason for the phrase "nice girls finish last", and this is what I mean. Fauxlivia is, as described by Peter, "fun" and "quick with a smile" and all that translates into "she let me get in her pants pretty quickly". Sure she's like Olivia in the sense that she's intelligent and born to do this job, but competency doesn't make you a good person. Poor Olivia is left with breakdowns and Peter's clothes in her washing machine, a closetful of pantsuits, and an inability to trust the man she thought she was meant to be with. HOW IS THAT FAIR?!?! Olivia did all of the right things and still, she's the one who gets shortchanged. Confirming yet again, that it's those people who DON'T play by the rules who end up with what they want. I have to figure out what rules I'm playing by and then stop playing by them, and stat. True kudos to Anna Torv though, who, by some fantastic feat of acting has provided me both with a hero and personal role model (Olivia Dunham) and an enemy (Fauxlivia) all by playing the same person with a few wig and wardrobe changes. Ugh, I'm exhausted just thinking about all of this, but I hope I've given fans of Fringe something to ponder. As has been stated before, if you're not a fan yet, I have seasons 1 &2 available on DVD, if you'd like to borrow. I feel like those PBS hosts "If you feel like becoming a fan now, there's never been a better time to pledge (your support)"
Hope you've enjoyed the first post back in a while. And if you've read this through, please leave a comment below. I always appreciate them!